Pet Rebellion Dinner Mate is the perfect resting place for your dog's food and water bowls. This stylish mat makes sure that any spills are absorbed and do not become ingrained into your carpet. 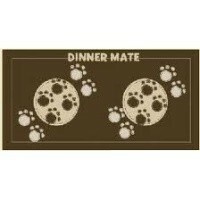 Acting as a barrier as well as looking great, the dinner mate will protect your floor from absorbing mess. The bottom of the mat contains a sturdy grip which will not move easily when in use and the dinner mate mat is also fully machine washable.